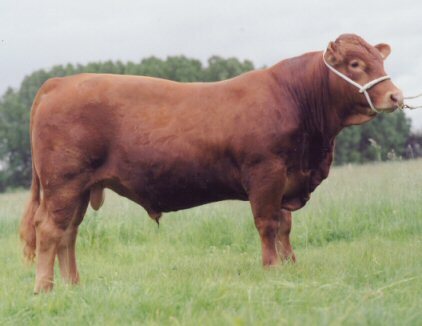 They are the largest of the British native breeds, being large-framed, more muscular in shape and later maturing. They are a rich, medium red with copper tints, though it varies in shade and can even appear slightly mottled. Their skin is exceptionally thick, loose, and mellow. They have a wide muzzle and dark eyes. They are mostly horned although naturally polled individuals do exist and polling is now being actively pursued. South Devon yield leaner carcasses than do other British breeds. Their temperament is excellent. Henry Wallace, former US Vice-President, was the first to import the breed into the United States. A breed society was formed in the US in 1974.